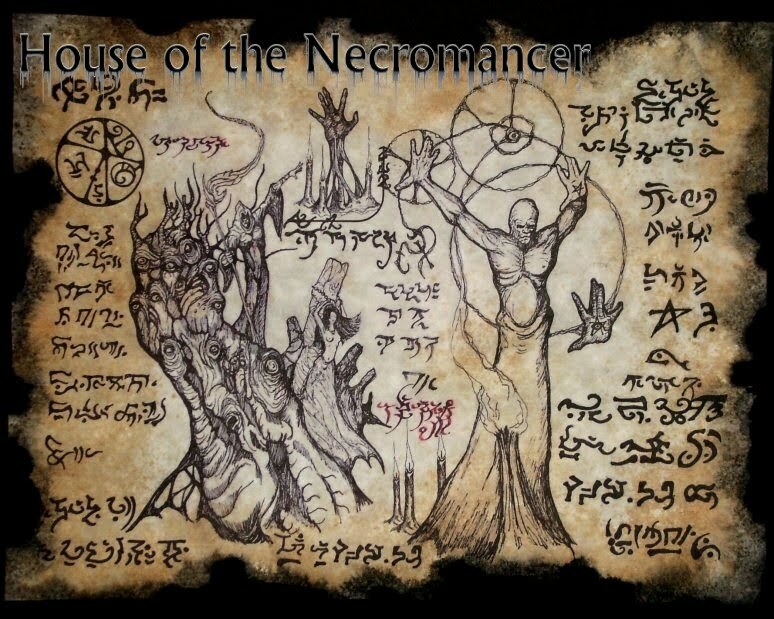 In the chaotic realms beyond Kadath there are ten Lords, less than gods but greater than flesh, they are the Demons of the greater order. They are to be invoked with the utmost caution for they delight in atrocity. 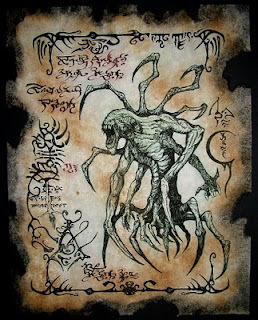 The fourth Greater Demon is known as K'Hurru'ss, though this is not his true name. Before the Gods of Man came forth to dwell in Kadath the Greater Demons crawled from the abyss to claim the chaos realms. But they were not the first to dwell in these places, for in the fourth realm they discovered a great stone seal covering a chasm. Gathering their strength they shattered the stone and K'Hurru'ss emerged. 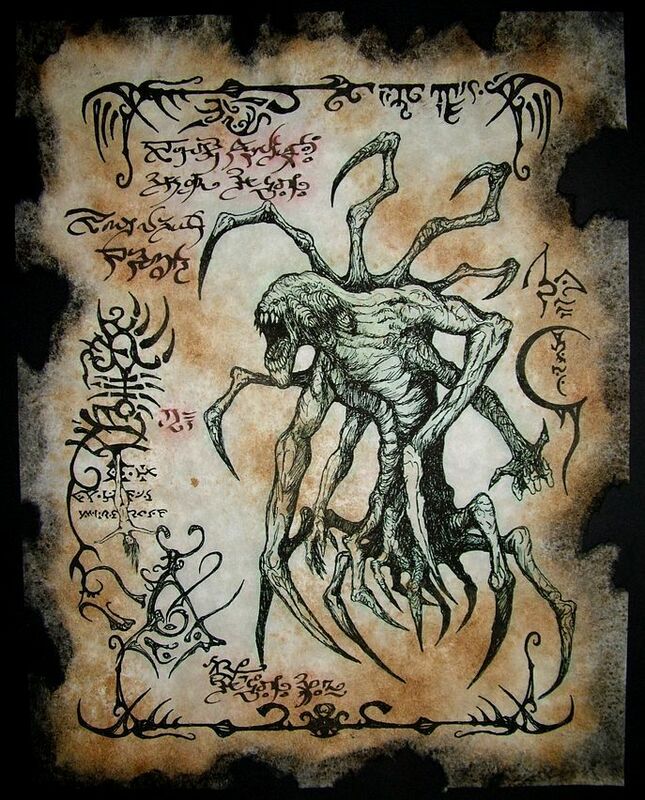 The demons claimed him as one of their own, but it is theorised by the Prophets of Pnom that K'Hurru'ss is one of the Great Old Ones, though the aeons long imprisonment robbed him of much his memory and intellect. 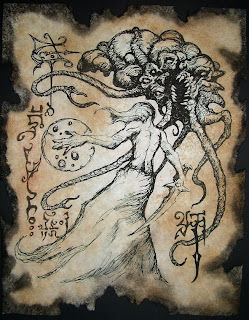 When the Gods of Kadath were young and uncertain the Greater Demons unleashed K'Hurru'ss and a host of demonspawn. War raged across Kadath, Mighty Nodens led the young gods to slay countless hordes of demonspawn until they came to face K'Hurru'ss. The lesser gods were swept aside and only Nodens could stand before that monster from primal times. Their battle raged for days and finally K'Hurru'ss struck down Nodens and ripped the god's heart from his breast. Great Noden's body fell lifeless but his heart continued to beat in the jaws of the monster. Finding wonder in this, K'Hurru'ss left the battle and returned to the chasm he had sprang from, taking the beating heart of Nodens into his lair. The Gods of Kadath despaired, they were no match for the monster and feared what power the beast would gain if it devoured the heart of the mightiest of gods. Only one goddess, Io-Ilaysha, dared go into the pit where K'Hurru'ss made his home. She was not a goddess of war or the hunt, but favored song and kindness. Io-Ilaysha went into the pit and offered herself to the monster in exchange for the heart of Nodens. The beast K'Hurru'ss accepted the bargain, casting aside the heart of Nodens and dragging his new bride to the very depths of his chasm. The Gods of Kadath fled with the heart, back to the battlefield where Nodens body lay torn asunder. The heart was restored and Nodens lived again, but changed with the knowledge that the gods of men were but small things in the hands of those from the outside. The Greater Demons restored the seal guarding K'Hurru'ss pit. 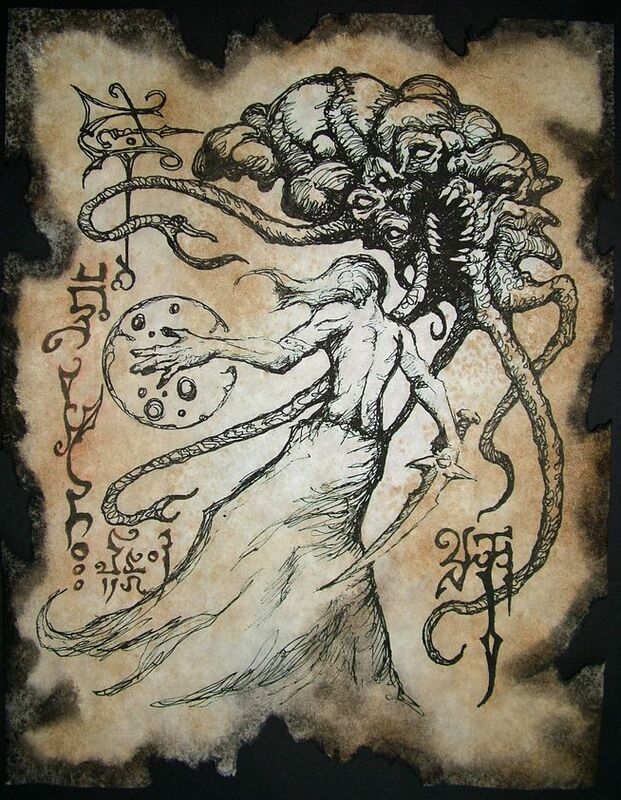 But their knowledge and power is less than those who first built it and The Prophets of Pnom have spoken that the seal will be broken again when the stars come right, then shall K'Hurru'ss and all the numberless spawn he has begotten on Io-Ilaysha be released to the ruin of Kadath and the worlds of men.